LICF the "CELLAR" forum an evil place not to be. - Paul Petrea and associates. LICF the “CELLAR” forum an evil place not to be. Who are they and what are they doing there? LICF the “CELLAR” forum an evil place not to be. Decent people keep coming with more information, others work for its destruction and dismantling; Karma is closing in. He will fall!!….. Let’s publish a few names first among the bullies. All known cyber stars hanging on this forum either, for crooked business, scams, or as a token of good standing in the low life community, act indispensable for gaining respect and trust by this group living in the Philippines. And it works. 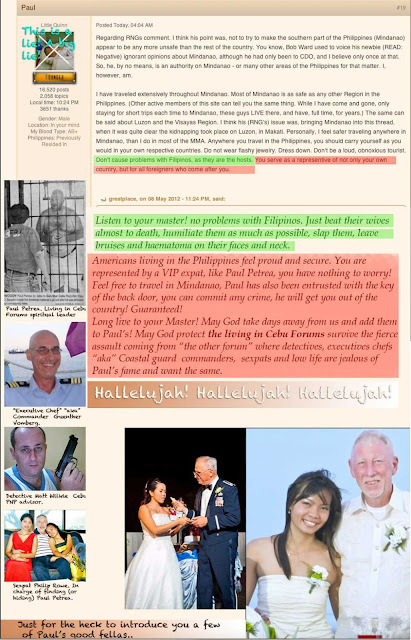 That’s what keep Paul Petrea and its cohorts afloat, by buying advertisement banners or paying “sponsor’s” fees for the right to be part of the indecent gang in the hidden forums. Some of them are residents of my hall of fame, for others, I have information but waiting for confirmation that might never come. I’ll explain this later. Let’s get started with a VIP resident on my wall of shame. Tim Potter, “aka” The Norsemen” “aka” USMC, “aka” USMC retired. you don’t have to take my word for it, let’s see what others had to say about Tim Potter. 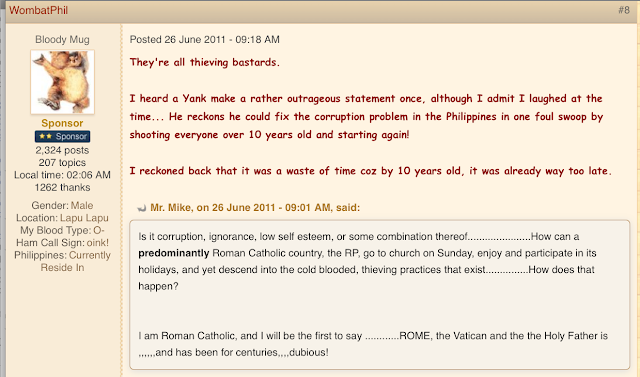 This one is coming from the now defunct forum of Matt Wilkie. Tim Potter has some hacking skills, works as a “hacker for hire” (among other criminal activities) targeting unsuspecting victims believing he can do it. The reality is that Tim Potter can only hack sites that did not respect the basic security rules or a crooked ISP provider that he does not offer DOS protection. Tim Potter was using the screen name of Norseman when he subscribed to an LICB forum nightlife forum belonging to these guys here. 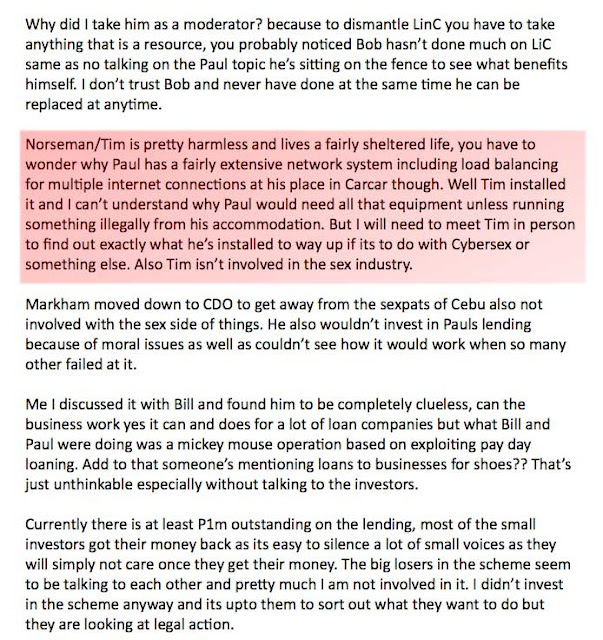 Tim Potter, having income only what he’s stealing from the US government for a few years served as a Marine could not survive without the extra revenue from crooked business in the Living in Cebu forums. Matt Wilkie always knew who the “real Paul” is, Matt Wilkie was an active member, still is, never was banned or unsubscribed his membership. As a peddler, crook himself needs his company to keep his reputation up and running. But since “Evan the stalker” put his nose in, communication is now taking place in private. Tim Potter is everything else except a harmless. Even now, that left the PH for Texas, can’t find a job, with a wife not having any professional skill and him in his 60’s now (Go find a job!) still a hyperactive on Paul’s forum. Click here and read more of the story. (Links aren’t functional, the site was taken down by the Cebu government) Read about a criminal that at the age of 27, after beating up two Filipina wives back in Georgia fled to the Philippines to further his psychotic behavior towards women. JJ, his first wife in Cebu gives her testimony on this forum. Please click here and read the history of this forum. LICF the “CELLAR” forum an evil place not to be. Folks, before the year 2010 when I stepped in there wasn’t hidden forum; everything was written in the open, outrageous, careless statements and act exposing even their own wives, members were competing who’s coming up with the most humiliating one. Here are a few examples. Deeper into the history. Look who’s representing the US and the foreigners. (His words) Someone who hasn’t paid a single dollar in taxes, he left the US at the age of 30 collecting disability insurance, thanks to few good men/Samaritans who wrote to the SSA and the disability allowance is gone. Long ago! Ahhhh!!!! the fecking stalkers!!!!!!! 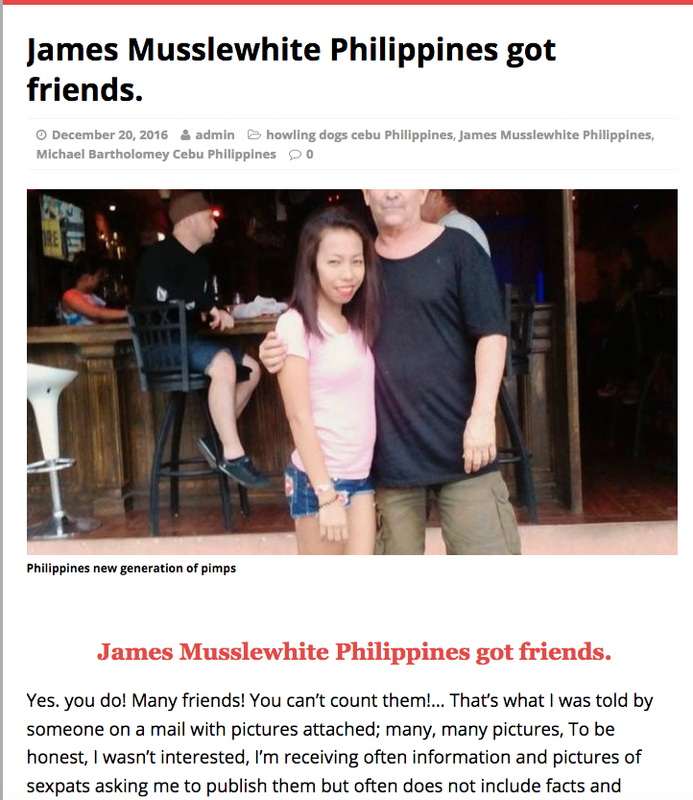 LICF SEXPATS PEDOPATS GOOD PEOPLE & THE REST OF US. I'm not sure if you realise it or not, but I want to let you know that you're doing good work by keeping us updated on these low life scum. Thanks so much.